Yes, it’s me. Marc Hershon. Your host and 100% genuine cowhide casual travel jacket for Epi148 of Succotash, the Comedy Soundcast Soundcast. Your ears are staring down the barrel of another Succotash Chats show, this time around featuring my conversation with podcast pioneer – yes, I’m using the “p” word – Jimmy Pardo! I’ve spoken with Jimmy a couple of times while I was at the Los Angeles Podcast Festival but this is the first time I got to yack it up with him mano y mano. We talk about his Never Not Funny soundcast, now in its 11th year, and how he was one of the first guys to cast his line out into the soundcast pond. We also talk about his upcoming Pardcast-a-thon 2017. It's 12 straight hours of live soundcasting for a good cause. And although he won’t come right out and say who his guests are, he does hint around enough that you should be able to get a good idea of who is going to drop by to help him out next Saturday, March 4th. Also in this edition of Succotash we have an installment of our Burst O’ Durst segment, with political wag and social gadfly Will Durst, and a visit to the Tweetsack to read your tweets and emails. And the whole hot mess is brought you by Henderson’s Accountant Pants. I reviewed two soundcasts for Splitsider this weeK: Matt Gourley's I Was There Too with Back To The Future's Tom Wilson & Tyler Marchant's Cynical Cartoons with Jay Oliva! I also mentioned listening to We Got This: Lethal Weapon vs Die Hard & and Deep Night with Dale: Greg Hildreth! Then, over on Huffington Post this week, I reviewed Criminal, which looks at faking your own death, and Dumb People Town with guest comedian Matt Braunger! Other shows I mentioned there includes Terms — Episode 13 - Preamble; and Good One — Neal Brennan’s White Guy Being Called the N-Word While Feeding a Horse Joke. I wanted to do a quick shout out to our associate producer Tyson Saner. I’ve got an arsenal full of podcast clips that Tyson has harvested and I will be unleashing them in the next edition of this very soundcast. But I wanted to let you know that Tyson has teamed up with a big soundcast listener and supporter, Hunter Block, to bring you a show of their very own. That’s right. 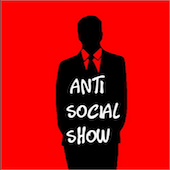 It’s called The Anti Social Show, and it’s up on SoundCloud. And that is pretty much that. The best way for you to help pass the Succotash is to let your friends and family know that they can get it in a ton of different places: The Laughable app, iTunes, Stitcher, SoundCloud, Overcast, Podbay, iHeart Radio, YouTube, on our Facebook page, and even right from our homesite at SuccotashShow.com!